The discovery of the afterglow. To the left is an image from the so-called Pan-STARRS telescope in Hawaii taken before the explosion. To the right is an image of the same part of the sky taken with the Nordic Optical Telescope a few minutes after the explosion was registered by the Swift satellite. The carbonaceous dust is registered in the measurements as a "dust bump", that is, a high value of dust with the said composition. This ultraviolet dust bump has now been detected in a gamma-ray burst, which has been named GRB180325A and the result has just been accepted for publication in the journal Astrophysical Journal Letters. The lead author is Tayyaba Zafar who completed her PhD studies at the Niels Bohr Institute in Copenhagen and is now working at the Angle Australian Observatory in Australia. Several other researchers from NBI are co-authors of the article. GRB180325A was detected by Neil Gehrel's Swift Observatory (NASA) on 28 March 2018. Swift is a satellite mission that detects gamma rays from the dying stars. When such a detection from the satellite hits the astronomers, a hectic period begins. The astronomers try to observe that part of the sky as quickly as possible in order to secure the crucial information that allows them to study the interior of the galaxy the explosion originated from. In this case Kasper Heintz, who did his master's thesis at the Niels Bohr Institute and is now a PhD student at the University of Iceland, was on duty. He activated the Nordic Optical Telescope (NOT) at La Palma, where Professor Johan Fynbo from the Niels Bohr Institute was observing for another project. The first observations of the light from the gamma-ray burst were secured only a few minutes after the discovery by Swift. The observations from NOT showed that the star had exploded in a galaxy with a red shift of 2.25, which means that the light has travelled approximately 11 billion light years. 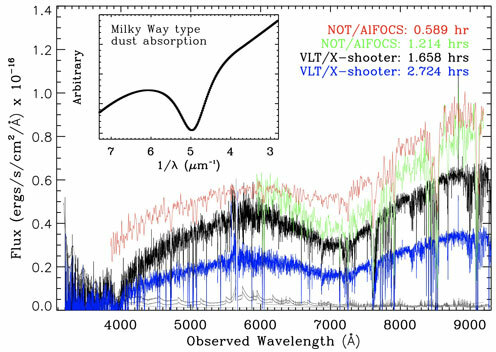 The observations immediately showed that the dust bump, known from the Milky Way, was present in this galaxy. The team then observed the gamma-ray burst with the X-shooter spectrograph on ESO's Very Large Telescope (European Southern Observatory) on the Cerro Paranal in Chile. All in all, four spectra of the afterglow from the gamma-ray burst were secured - all with a clear detection of the dust bump.